It is almost inexplicable how a classic Jelly Slide can captivate us so much. PUMA and Rihanna are here to take all your coins and there's no winning this war. It doesn't help that we have a weakness for pink. Feast your eyes on the must-have FENTY PUMA by Rihanna Jelly Slides; hypnotic translucent jelly tone slip-ons that boast the PUMA logo on the textured, all over, wide Jelly strap, the FENTY PUMA by Rihanna logo on lateral side, and a whimsical diamond pattern outsole. 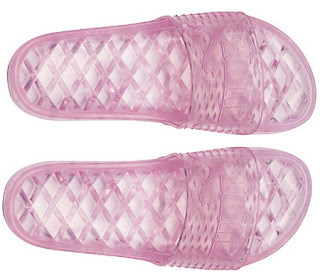 As we mentioned, we have a weakness for pink, so it'd be our go to color, but this casual chic slide also comes in a white aka clear, and black (its transparency makes it look like a smoke colored sandal). All three colors are currently still available on www.puma.com for $90.00 each. Who knows how long these will last before they're sold out. Which of the three is your favorite hue?